Rather than simply pointing out this past weekend's amazing shot by Tiger Woods would make a great Nike ad, Joe Jaffe just went out and made the ad. Well, he added "Just do it." to the end of the footage but it certainly does make for a great ad. Does this mean that if Nike does make the shot into an ad, they have to pay Jaffe? Hmm. To illustrates the fact that one third of all smokers will die from smoking, this PSA uses a powerful analogy involving cars and pedestrians. It hits home. 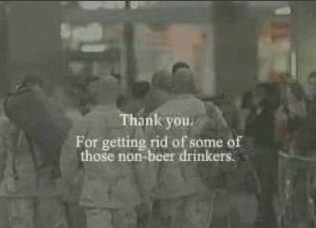 Why it took so long, we do not know but someone has made a minor edit to the ending of Budweiser's brilliant Super Bowl Military commercial inserting what was probably on the minds of some but was, wisely, left out. Rather than sit through the entire minute long, 4 MB file just to see the pay off, here's a screenshot for your enjoyment. While we loved the original commercial better, it's nice to see the return of the old fogey, Mr. Six, seen in this spot walking in his bed at the retirement home, prepping a Six Flags park then breaking into his signature "We Like to Party" jig. If life as an Eskimo causes a woman to fantasize she's tongue kissing a hunk - but in reality is tongue kissing her dog - while watching MTV in her igloo all in the name of promoting MTV's Spring Break 2005 in Cancun, well, we guess we'll go along with it.